Since we don’t have snow here in our country and December breeze hasn’t arrived yet (why, breeze? WHY!! ), I can still get away with outfits like these. Every time I wear something like this, it feels like the sun just can’t get enough of me. All of a sudden, everything just seems so bright and sunshiny happy. 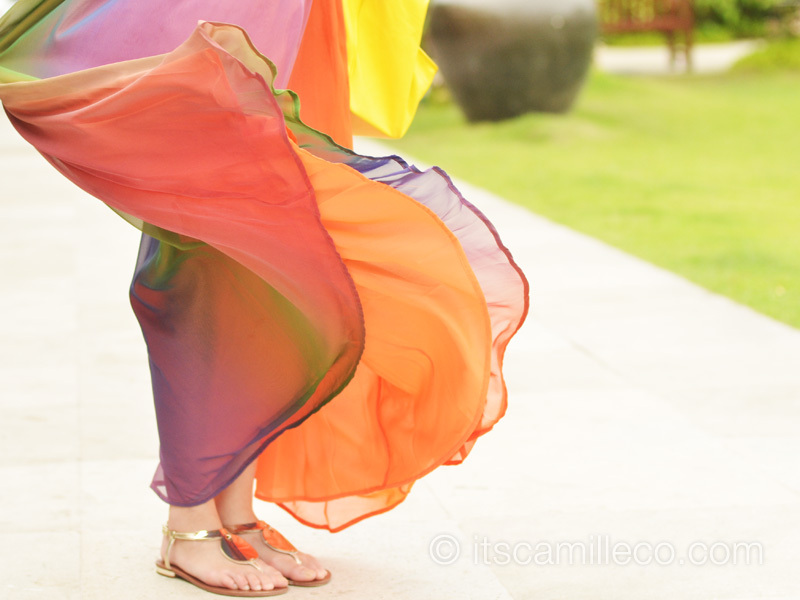 Don’t you just love the rainbow colors of my skirt? They look even more amazing whenever the wind comes my way. Lissa, one of my blogger friends who I take outfit shots with quite a lot, actually noticed how the wind loves me so much. Every time I take outfit shots, it makes its presence felt. Usually, it works to my advantage, except when it ruins my fringe or blows my skirt up and reveals my babies for everyone to see. LOL. 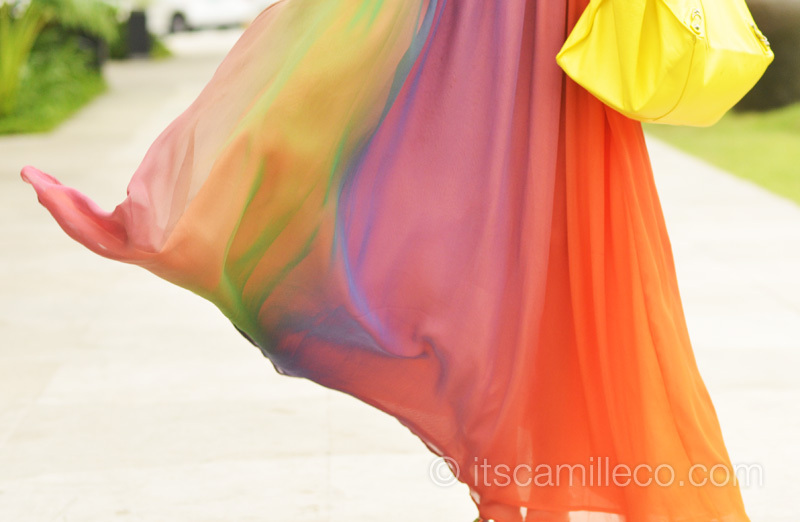 super cute rainbow skirt! <3 pretty earrings! I love your skirt! :) Merry Christmas. wow!!!! so beautiful!!! love the skirt and the top :) where did u get your top pala? 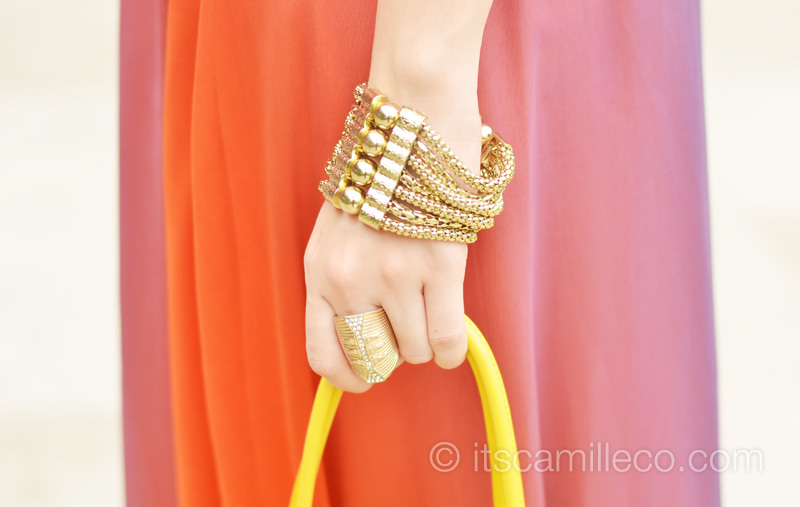 ..-really love the skirplease help me where can I buy this..hahah thank u ms Camille you’re so gorgeous.. The link is there :) Thanks Janel! hi miss Camille. it’s a lovely u got there, soo colorful. love it. i have a question miss, is it okay to combine red and orange? I bought one of your dresses sa BU4 (h&m brand) grabe ang tangkad na babae ang liit-liit ng katawan. talagang si ate na saleslady mega sales talk na bagay at kasya daw saken ung dress di nya alam talagang bibilhin ko yun, kahit medyo maliit, papa-alter ko na lang. ;) hehehe! Haha ganun talaga yun haha so funny! Thanks Honey! WOW! stunning as always Camille. I hope I could see you in person with Kryz! Gorgeous! everything is perfect! That’s the reason why my girls like you so much:) They would love to meet you one day..
Awww thank you VCS! :) I’d love to meet your girls! Saan nga po pala ninyo kinunan to Miss?? ganda ng background eh..
Gorgeous dress, way to dress up for the warm weather!! Wish it was cooler though. Good thing I’m headed out of town for the week. What type and brand of tights would you recommend to keep me warm in case it’s too cold? Most of the brands here are too thin and I saw you wear tights in the cold in your past photos. Thank you! Have you ever heard of Wolfords? My friend from abroad has been recommending them to me! Once I get my invisibility powers, I’d sneak into your closet and take all your bags with me. Gorgeous !! Love the dress !! show your forehead more often na…lalo na this 2013. I love everything in this photo. I’m a fan <3 xo! What type of BB Cream do you use in Etude House? Love how it matches with your hair! ..But I see our true colors shining through….. True colors are beautiful, like a rainbow…. WOW, This look is so awesome :). You look like a fairy straight from heaven :). Loved this look <3. I like your outfit. super meant to be lang talaga lahat ng pieces. Hi Camille! This is the first time I commented on your post. I’ve been checking your blog ever since. With that, I always get giddy and excited whenever I check out your blog posts! This entry was really superb! I’m one your biggest fans! I really love how you mix and match all sorts of clothes. Hoping to see you in person! Keep posting! Thank you Clarisse! :) Happy reading! Hi camille! Love this look. Yung tipong mapapansin ka tlga bcoz of the color palette that u’ve chosen.hahaha i have a random question and I hope you’ll answer this…hehehe Ano yung current car mo ngayon? (The brand and the model) Thanks! I love this look is spectacular and you look authentic! That outfit makes me happy! I love the colors. wow ! 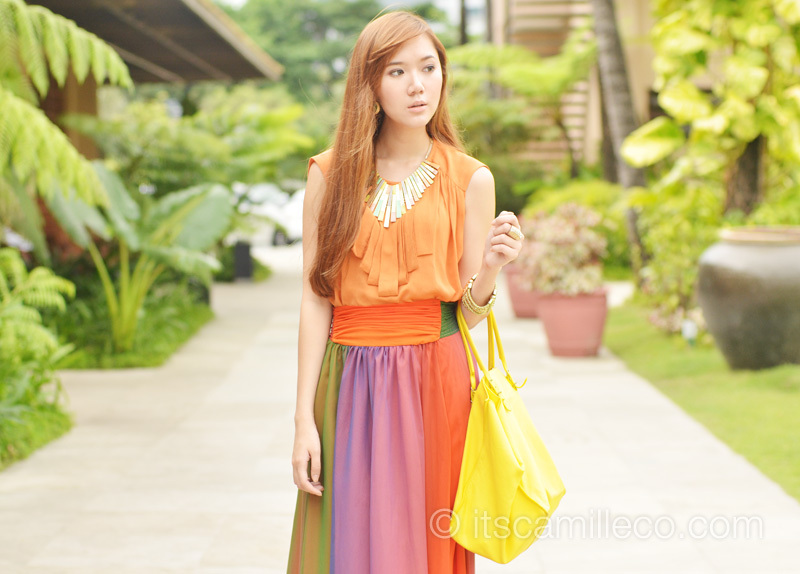 I thought it was maxi dress, but when I scroll down, it was skirt pala! I love the way you match it with your tops, plus your hair color.,perfect!btw, what’s the colorof your hair pala Ms. Camille? ..this s the first time i will comment here..
haha.. well , i always check ur blog.. I do love your rainbow-colored skirt. I remember the bridesmaid’s cocktail dress I wore during my older sister’s wedding. But that was so many years ago. Beautiful and very refreshing. Lakas maka Lee Gyu Hwon of Heartstring ng skirt mo. hehe. Ay I don’t know that show! :) Thanks Jhaycee! wow! I so love it camz! you’re so pretty and I’m digging that look! ♥ as always! aww the dress is crazily beautiful!! Hi Camille! What’s your lipstick here? Such a great and happy look! You really look good on those outfit. I love how you blend all those bright colors. I hope you can follow my fashion blog too. AHHHH Another “boombastic” shoot! hahaha. You always surprise me with your outfits Camille. Look how gorgeous you are! :”) I LOVE IT! I love your skirt . I love how you dress and how you explore to different kinds of styles . Some of your outfit are prints and i love how you mix a print over another print and will still turn out great ! You really do have fashion sense and great taste ! Thanks Alvina! :) Practice makes perfect! Ay go! I pronounce you woman and skirt haha! :) Thanks Zaira! Hiyang hiya naman daw sayo si Anne Curtis. I’m sure you’ve seen her in person na. If you are to rank their (Anne, Solenn, Isabelle, and Georgina) beauty, sino pinaka-bet mo? Parang ang hirap no! They’re all soooo beautiful! Sino mas matangkad sa inyo ni Georgina? Nasa 6ft+ ba siya? Ay nahiya naman ako! Haha! They’re all so pretty and hot! So hard to rank them really! Georgina is waaay taller than me. I’m guessing she’s maybe 5’10″? WOW! OMG! GANDA! <3 Love this outfit. Peg kung peg. Hi ate! What kind of dslr do you use? this dress is summer! I love it! You look so gorgeous in whatever color you wear even when you put them all together just like now! I always love your looks Camille! More power! OMG. stunning. *_* HAHAHA. and I like the photo of the skirt. kind of cooooooool.